Ships launches are sometimes wild affairs, and depending on the method used, making a big splash can be part of the drill. The Freedom Class of Littoral Combat Ships do just that, being slid off the pier where they were built sideways. On Jan. 30, the soon-to-be USS Sioux City was the sixth LCS to take this grand plunge. 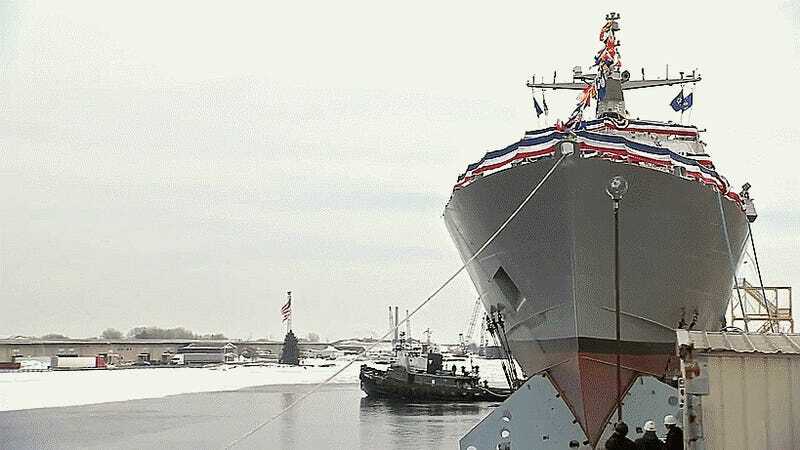 The Freedom Class, for which Lockheed Martin is the general contractor, are built at Fincantieri Marinette Shipyards in Marinette, Wisconsin. The sci-fi-looking Independence Class is built by Austral in Mobile, Alabama. Most probably find it odd that the Navy is buying two classes of ships to do the same missions (although the fact that either can’t do many of those missions is a whole other topic) while the Pentagon has been pushing one-size fits all solutions like the F-35. With shipbuilding being such a politically charged and pork-laden topic, the two designs have slid by for years as the LCS concept continued struggling to find an identity. Now, the Secretary of Defense has demanded that the Navy down-select its LCS buys to a single design and reduce its total planned LCS fleet from 52 to 40 hulls, the question of which shipyard will stay in the LCS business is up in the air. There are some prospects that at least the Freedom Class could continue to be ordered in smaller numbers in the export market, should it be cut from the Navy’s procurement plans. Saudi Arabia is in deep negotiations to buy a much more advanced and capable variant of the ship, although the high-costs of development and possibly plunging oil prices have put this potential order on shakier grounds. The Freedom Class, which has been in commission for nearly a decade, has recently run into a spate of major mechanical issues while at sea. Two of the $360+ million boats have had major propulsion troubles, leaving them stuck in port and high-cost repairs could be in both their futures . This is not good news for a design that has already struggled for years to meet operational needs. Meanwhile, the Navy is circling its wagons to defend the LCS program as the ship is seen as a way for the sea-going force to meet its operational ship number goals within ever-tightening budgets. Although an LCS can provide literal presence, no matter how many ships you have, it is as much a question of available capabilities as it is just numbers. When it comes to the LCS that was built to fight in shallower waters, those capabilities remain limited and the ship cannot fight in the upper-end threat environment spectrum without nearby and much more advanced escorts.